Dennis at the Kolb facility is making up an aluminum 18 gal. tank for the 3X . I'm not fond of a fill in the interior of a fuselage so am looking for ideas for an exterior fill. 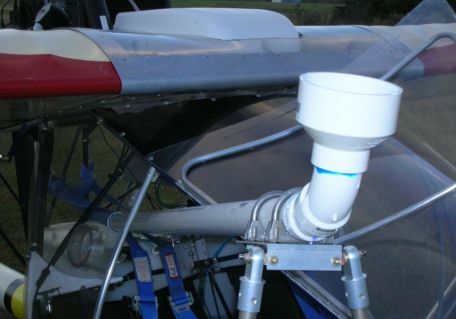 Rural nature of use will require fueling from cans at least half the time so underwing location doesn't seem too feasible..... has there been any success mounting one below the engine through the aft flat area of the fuselage or vertically through the center section? At this point the tank and fuselage fittings can be located wherever works best. I have a filling system like you have proposed. It is in a higher pressure area so you don't have to be worried about fuel flow issues if the seal gets compromised. I used a boat fuel filler that also has a vent for venting when filling and fuel delivery. I do caution that the angle of the tube back to the tank is low so there can be some burping of fuel if your fill too fast. Using 5 gallon cans is never a problem but filling with a huge airport fuel nozzle takes careful use. Also Lexon doesn't like fuel being spilled on it. I can send a more higher res photo direct if you need it. top rear of the fuselage under the engine or to one side of the engine. Can't remember for sure. Last time I flew it was 28 years ago last week. section, but that is a task I seldom am required to do. could/can easily see the fuel level. Very accurate and fail safe, I hope. just did me in trying to fuel and after several tries I came up with this. PSSSTT! Rick! The picture! You forgot the picture! You OK Bro? Talk to me Rick! RRIIICCCKKK!!!!!! Oh, NOSE!!!!!!!! That's odd. Both pictures are there in my copy. I shall try again. > just did me in trying to fuel and after several tries I came up with this. You OK Bro? Talk to me Rick! I came up with a simple fix to fuel my mkiii. I made an extension to fit my gas can nozzle. With the 5 gal gas can on the ground the extension will go to the bottom of my 16 gal alum tank. I lift the fuel can to my shoulder, grab an exposed alum hinge to eliminate static. A friend of mine who owned a Pitts S-1 was fueling it from a 5 gal can as I walked past his hanger. This was many years ago. I was amazed at how simple his fueling system was. 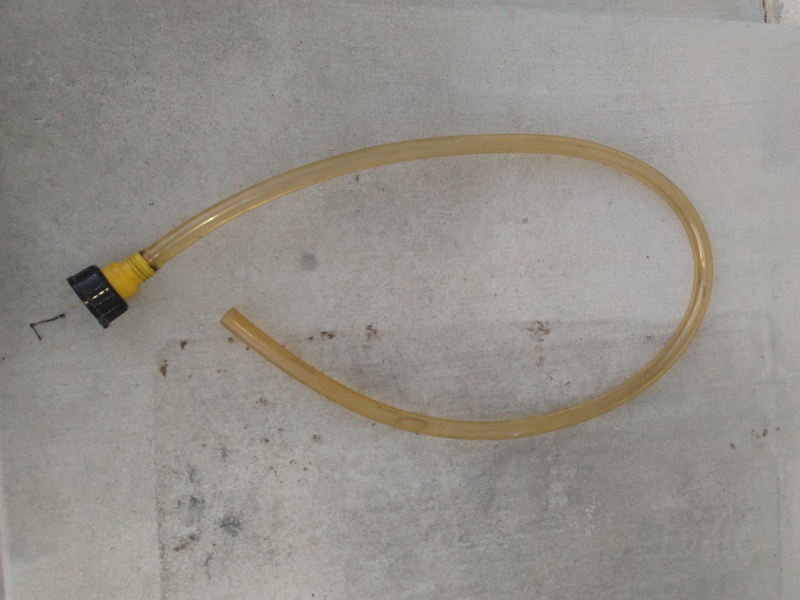 His fueling system consisted of a plastic 5 gal can and 6 feet of 3/4" ID plastic tubing. The tubing was pushed on to the nozzle of the can. Stick the tube in the fuel tank, lift the can higher than the nozzle and you are home free. On long cross countries I always carried that tube. Now days I carry an Alabama Credit Card which uses the little shaker valve to start siphoning fuel from the gas can. I usually sit the can on a folding ladder, if available, or on top of the engine if all else fails. Since I have gotten older, I usually don't try to save money fueling from 5 gal cans. Lots easier to fill from the 100LL pump. Experimenters come up with unique ideas to accomplish what they need to get done. Boyd's message popped up right after I hit the send button on my fuel fill system. Great minds think nearly alike. That is a pretty good solution, but for fueling without holding the can up in the air I went with a battery operated pump. Look on Amazon or your favorite shopping site for a TerraPump. The one I have was about $40. Runs on 2 or 4 AA batteries. Has adaptors to fit many brands of gas cans. The pump goes down in the can and will reach the bottom of my 6 gallon Rubbermaid ones. It has a fuel sensor that will shut the pump off when the tank gets full. The pump won’t lift fuel very far but on a nearly level transfer on 3 good batteries it will move 5 gallons in 2.5 minutes and not spill a drop. For filling my Firefly I have an old plastic spool that when stood on end is just the right height to set the can with the pump on. Then put the hose in the fuel tank (it clips right on) and hit the start button. It will run until the tank is full , the auto shut off. I will try and remember to take some pictures next time I am fueling. That sounds pretty darn neat. Fueling the MKIII ain't like it used to be. 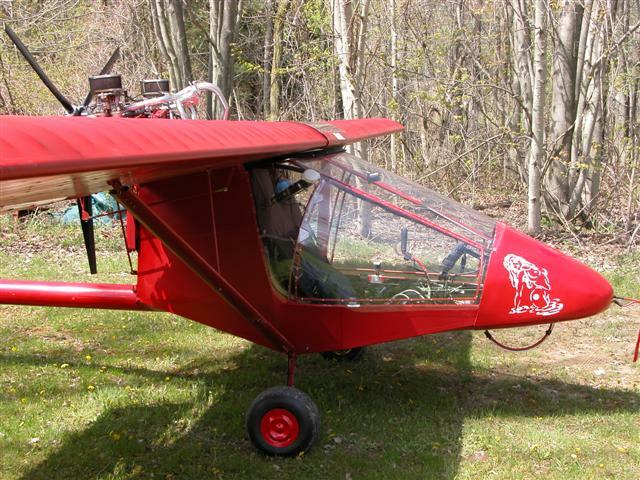 I could use something like that, but I have to pump all the way to the top of the wing. That little pump might be grunting to push fuel that high. Wonder if you could get a transformer that equates to 4 AA bats? The Terra pump looks great i'll have to order one... I have been using the long skinny one like the Sierra pump on Amazon to fill my Firefly. Which does work fairly well but doesn't pump too high just put the can in the seat but the pump flops around and the switch broke right away and I had to solder in a new one. I don’t think the pump will push more than a foot or two of head pressure. My little stand makes it nearly level with the tank, but if it is lower, the flow rate sure slows down. Pretty sure the motor works on only 3 volts as it will run on only two AA’s. The second two batteries just give it more amps. I use rechargeable batteries and have never had to recharge them during the summer. Of course, I don’t fly as much or use as much fuel as most people. Since I had the batteries and charger for other devices it is no big deal to just swap them out when they get low. I have been thinking about making a transfer pump for diesel for my little tractor. A Faucet style 12v. pump with 5/16” fittings should provide enough flow to fill my little 4 gallon tank in a couple of minutes. Might work for your airplane too. Since you have a ready 12v. power supply right there…. Do give it some thought before rolling your own gas pump. The little AA powered ones get away with it by using such a low voltage that it can't make a strong enough spark to light the gas. Not much risk inside the tank anyway (too rich), but a 12v battery and a switch outside the tank deserves respect when used to pump gas. I came up with a simple fix to fuel my mkiii. I made an extension to fit my gas can nozzle. �With the 5 gal gas can on the ground the extension will go to the bottom of my 16 gal alum tank. I lift the fuel can to my shoulder, grab an exposed alum hinge to eliminate static. I thought about fuel pumps for transferring gas, but quickly discovered an easier system. Anyone ever heard of a siphon? Now I don't like to get a mouthful of gas either, but with some thought beforehand, tasting gas isn't necessary. I use older Rubbermaid 5 gallon gas cans. Lift and rest the can on wing or ladder to a height of at least the height of the gas tank filler opening . 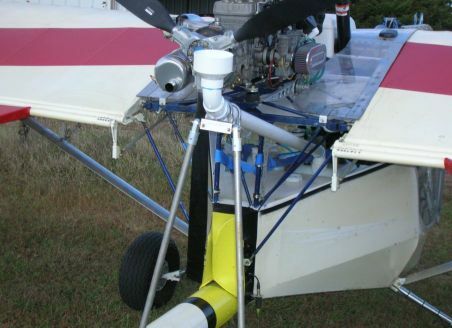 Insert clear plastic tubing to the bottom of the gas can with other end into the airplane fuel tank. With any vent on the gas can closed, wrap thumb and first finger around tubing at gas can neck, creating a semi-seal and leaving just enough space to place your lips to blow into can to start gas flow. When I see the gas can is near empty, I start tilting it point the tubing onto one corner to completely empty the can. Works every time with no gas tasting. That is a good point. Sparks and vapors = bad things. In the case of the Faucet style the pump and wiring is located outside of the gas can. You would have to drop a pickup tube/hose into the can. The most likely place for a spark to occur would be at the battery connection. If a switch were used, a sealed one would be best. In an open air situation unless the spark was fairly close to the open can or tank this is probably not too much of a concern, but caution is always advised. In my situation I like the battery operated pump because I don’t have to mess with wires and just the one hose. For fueling the Firefly, it is much easier with the wings folded so I fuel up before doing anything else. At the gas station I put exactly 5 gal. in my 6 gal. can(s). As soon as I get to the hangar I add Sta-Bil to each new batch, even if I intend to use it right away. Next, is the only messy part of the operation. I have to take the TeraPump out of the mix can put it somewhere clean. Pour a gallon or two into the mix can, then add my 2-stroke oil. Use a little fresh gas to rinse the measuring cup and make sure that all the oil gets into the gas, putting the rinse into the mix can. Shake slightly, then pour the rest of the fresh gas into the mix can. Replace TeraPump. Agitate again, just to make sure. Then set the mix can and pump on something (plastic spool, chair, etc) close enough to reach the tank with the hose. Clip the hose to the tank and hit the start button. In a couple of minutes the tank is full and there is no spilled fuel. While the pump is running I do my preflight inspection of the engine, mounts, fuel and electrical system because it is so much easier to get a good look while the wings are folded and I am standing there anyway. I don’t have to watch the fuel flow as the pump will shut itself off when the tank is about an inch from being full. pumps fuel up the hose until it starts to siphon. me that flight and still use it. Thought I had lost it for several years. Would it not be easier to put the Stabil and two stroke oil in the gas can before buying fuel? Save a few operations maybe.